Supporters of former South Korean President Park Geun-hye with her portrait stage a rally to call for her release near the Seoul Central District Court in Seoul, South Korea, April 6, 2018. Impeached South Korean President Park Geun-hye has been convicted and sentenced to more than two decades in prison for abuse of power, coercion and bribery, at the conclusion of her criminal trial related to the corruption scandal that forced her from office. Chief Judge Kim Se-yoon announced the verdict and sentencing at the Seoul Central District Court Friday during the final session of the trial, which was broadcast live on television. “It is the decision of the court that the defendant Park Guen-hye is sentenced to 24 years in prison and must pay a fine of 18 billion Korean won (approximately $17 million dollars,)” Chief Judge Kim said. The former president did not attend the proceedings, and the defense objected that the live broadcast would make it difficult for her to receive a fair appeal trial in the future. The judge said the people’s right to know in a democratic society outweighed the defendant’s objections. The 24-year sentence is less than the 30-year jail term that prosecutors had called for. FILE - South Korea's ousted leader Park Geun-hye, right, leaves a prosecutor's office in Seoul, March 22, 2017. Park became South Korea’s first democratically elected leader to be forced from office last year after the Constitutional Court endorsed the impeachment vote passed by the National Assembly with more than the two-thirds majority support required. Both the impeachment and criminal charges stem from allegations that the former conservative leader colluded with her close friend, Choi Soon-sil, to force large Korean conglomerates like Samsung to contribute millions of dollars to two nonprofit organizations controlled by Choi. Chief Judge Kim detailed how Park worked indirectly with Choi to use the power of the presidency to intimidate large corporations into making donations for their favored projects, with the implied promise of favorable government treatment in the future, and the threat of retaliation if they did not cooperate. FILE - Choi Soon-sil, the woman at the center of the South Korean political scandal and long-time friend of President Park Geun-hye, arrives for a hearing for South Korean President Park Geun-hye's impeachment trial. “Seen from this case, these people like the president or the chief economic secretary have enormous power, such as (granting) various approvals and (initiating) tax investigations that can have a profound impact on the company’s existence and activities in general,” Kim said. In February, Choi was convicted of bribery and sentenced to 20 years in prison for her part in the scandal. The chairman of the Lotte Group, the country’s fifth-largest conglomerate, Shin Dong-bin, was jailed for two years and six months for bribery. Samsung Group heir Jay Y. Lee was jailed for a similar term on charges of bribery and embezzlement, but in a surprise decision in February, an appeals court freed him after a year in detention. Park apologized at her trial for seeking help from Choi, but claims she is innocent of all charges and never used the presidency for her own financial benefit. The judge, however, said Park elicited bribes totaling more than $20 million. Even if she did not directly receive the money, the judge said, she still used her power and influence to benefit Choi and surrogates, and that much of the money raised for the nonprofit organizations were structured so that it could be liquidated at a later time. Much of the indirect evidence against the former president was based on statements to the prosecution by corporate chairmen who met privately with the president, and on notes kept by former presidential secretary Ahn Jong-beom. Legal experts question the strength of the prosecution’s case, which they say failed to produce clear evidence linking Park to any political payoffs. Some critics say Friday’s verdict reflects a disturbing trend in South Korea’s democracy, in which former political leaders increasingly face legal persecution when opposition parties gain power. “I think the rule of law lost its balance in Korean society. It is faltering. It seems to me that the justice of law has disappeared, and the atmosphere of political repression seems to fill the court,” said Lee In-ho, a professor of law at Chung-Ang University in Seoul. Park’s conservative predecessor, former President Lee Myung-bak, is also being investigated for corruption. 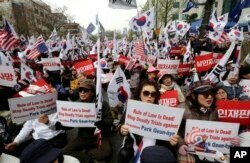 Supporters of former South Korean President Park Geun-hye stage a rally to call for her release near the Seoul Central District Court in Seoul, South Korea, April 6, 2018. Before her impeachment, Park’s public approval rating dropped to below 10 percent and she remains a divisive figure in the country. The presidential influence peddling scandal triggered weeks of massive public protests across the country, with outraged liberal opposition leaders demanding more accountability and transparency from their elected leaders, and an end to the corrupting corporate influence on the political system. Liberal leader Moon Jae-in easily won a special presidential election in May 2017, based in part on his promise to reform what he called “the culture of the authoritarian president.” Moon has said he would end the use of presidential pardons for corrupt corporate executives, as was done in the past. He is also proposing constitutional changes replacing the single five-year presidential term to allow a president to run for two consecutive four-year terms, and to distribute some presidential power to the prime minister selected by the National Assembly. Kim Hyung-a, a Korean politics professor with The Australian National University, wrote in an East Asian Forum Blog that older Koreans in particular worry that Moon’s proposed constitutional amendment will make it more difficult for conservative opponents to regain power. “They suspect the bill may merely pretend to eliminate the authoritarian president culture and will actually inflate Moon’s own presidential power by expanding the power of the Blue House,” Kim wrote. President Moon has also enjoyed strong public support for his outreach to North Korean leader Kim Jong Un, and efforts to facilitate denuclearization talks with U.S. President Donald Trump.